For the first time on the 26th of April the Dutch theme park Toverland presented its whole new 4 hectare big theme area to invited guests. “De Magische Vallei” is yet another fantastic themed outdoor area at Europe’s biggest indoor amusement park and offers its guests attractions like a Mack Rides Spinning Coaster and a Hafema Wild Raft Ride. While the new rollercoaster “Dwervelwind” has already been open for public since the end of 2012, the invited guests were allowed to be among the first riders of “Djengu River”, which offers an exciting boat ride on white water rapids. 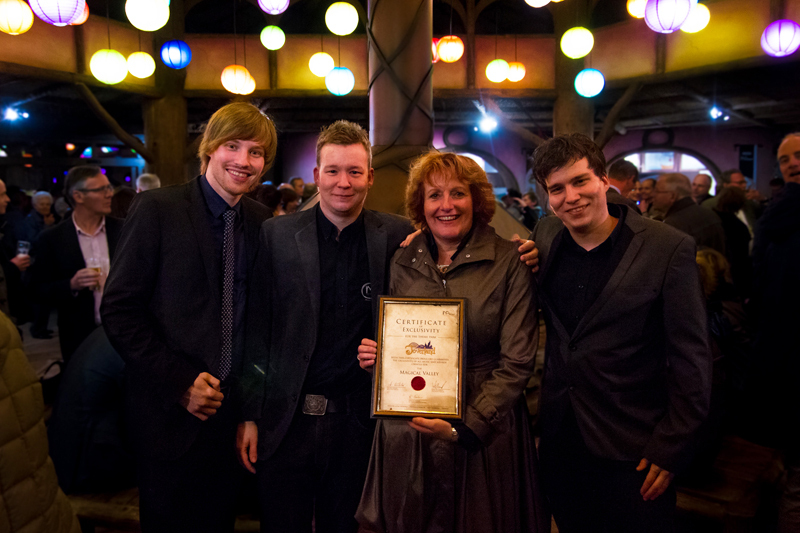 As part of the opening ceremony, IMAscore handed over the “Certificate of Exclusivity” to park directress Caroline Maessen, which officially confirms the uniqueness of all the music produced for Toverland. A total of more than 160 minutes of music and sound atmospheres have been produced for the new theme area. With an acoustic theming of this size, Toverland offers its visitors also in terms of music and sound something very special at the “magical valley”. The release date of the official soundtrack CD will be middle May 2013.